First, the excellent news. Not only did M make varsity soccer, as expected, but J made the JV volleyball team, which was a big surprise. She was super, super excited. Both girls have their first scrimmages this Wednesday and approximately a million practices before then. You probably remember that we lost our beloved cat at the end of May. We’re still at the missing-her-daily stage, but it’s likely that there will be another pet in our future. M is actively stalking the animal shelter listings, while J is a little more ambivalent. Part of the problem is that she’s unconvinced that we will ever find cat that we could love so much as our Isis, our Platonic ideal of a cat. I feel like we could find Kitty Love again, but it is a challenge. Frankly, a lot of cats are assholes. So we’ve been thinking about our next move. 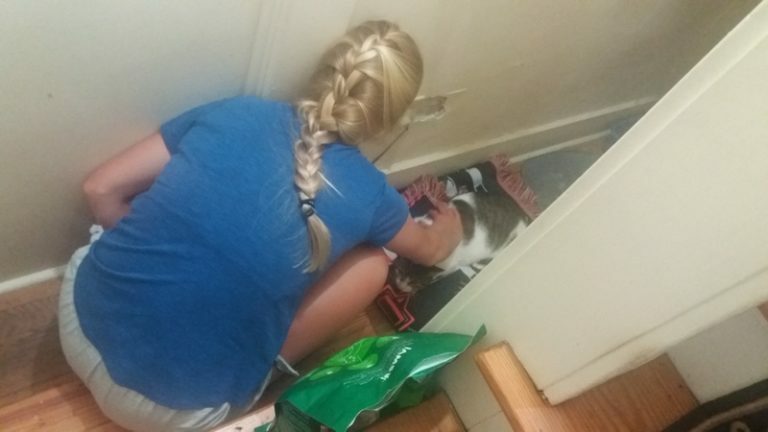 I had talked about possibly fostering a cat to see how that goes, and in the middle of us ruminating on the whole issue, a friend’s sister’s girlfriend suddenly couldn’t care for her pets, at least for a little while. A day or two later, we welcomed the extraordinarily shy Maya for a trial run. As Maya’s carrier opened and she scurried under the closest piece of furniture she could find, her human chaperones let us know that if we liked Maya, we could keep her. Oh! We weren’t entirely sure that we were ready for that kind of emotional commitment, but we’d give it a shot. We were told that she had a back-up home, so either way, she’d be okay. Too bad she didn’t know that. Oh, this poor kitty. She was very, very scared. 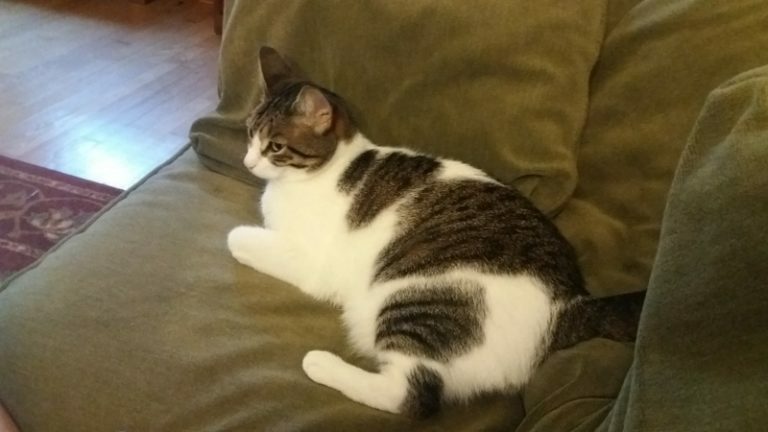 After some time spent Googling, we learned that we should try to confine her to a single small space, make food, water, and kitty litter accessible, and spend some time trying to bond and some time giving her privacy. We tried. The trouble is, it’s been a freakin’ hot August. 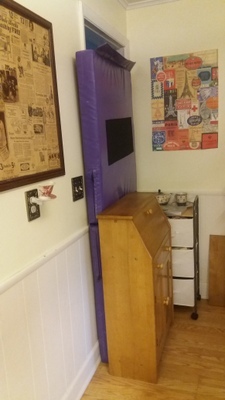 Basically, any possible room that we could have closed her into would have gotten super-duper hot and stuffy very quickly since we don’t have central air. The spaces in which the temperature is reasonable are all on the main floor or in the basement, where it’s very open. We started out by putting her into our little front foyer area and periodically cracking the door open for a bit of ventilation. She cowered under a piece of furniture in the little space. Things went as well as could be expected, but we didn’t feel like we could shut her up entirely overnight without getting her overheated, so we left that door open a crack and hoped for the best. The next morning she was missing, and after an exhaustive search, we found her near the water heater in the storage area of our basement. Well, that was no good. The storage area should have been closed up, anyway (damn kids! ), but even though the playroom is a nice enough place to hang out, we just didn’t want to let her get into the habit of staying in the basement all the time. This is partly because Cute W used to have a cat who basically lived in his family’s basement, just visiting the rest of the house, grudgingly, for some food once in a while. That’s an unsatisfying cat relationship. After erecting one ineffective barrier, J problem-solved us into this highly effective barrier. Sure, it blocked access to the playroom and most of our kitchen appliances, but we figured it was short term solution to a short term problem. After getting relocated to the front foyer for another day, and enduring and mostly shunning plenty of human attempts at bonding, Maya spent the second night exploring and was missing again the next morning. We finally found her in our very messy closet. Wow, this looks so pleasant and comfortable. I can’t remember quite how long she lasted in there, but at some point, I decided that since the front foyer thing wasn’t working, anyway, I would give up and put the kitty litter and food in their normal locations. And at some point after that, Maya took up residence on her kitty litter box. A few things you might notice here. First, yes, this is a very weird architectural space. One of the splendors and charms of an old house. Two, indeed, that is a little turd just outside the kitty litter box. Because it is difficult to fit your poops into a box when you have to fit your whole body in there. 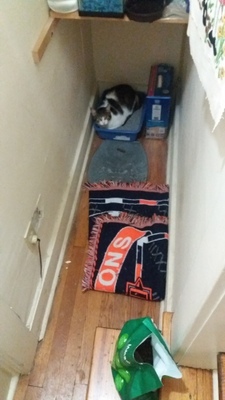 Three, yeah, that’s a Broncos blanket that one of my kids laid out of the floor in an attempt to bring the kitty some comfort. It has since been cleaned with some very hot water. And finally, if you notice that the wall looks a little battered on the left, that’s from me squatting down to clean the litter box years ago and bashing my knee into the super-old drywall of my charming old house. Okay, as disgusting as it sounds, sitting in your litter box is a very common thing for an anxious, frightened cat to do. We were still feeling really, really sorry for her at this point. We were still really hoping that she’d make some progress. And look! 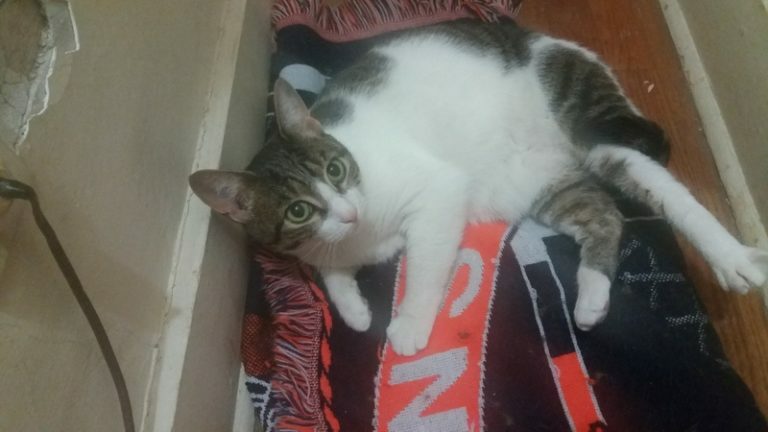 She did make progress, and she took advantage of that Broncos blanket. She liked to be petted. She even purred a bit and licked our hands. She seemed to be afraid to eat unless we’d “stand guard” near her food, so maybe the other animals in her normal household would fight her for food? We didn’t know. But we were willing to scrunch ourselves into corners and crouch in uncomfortable positions in an attempt to bond. But it had been several days, now. 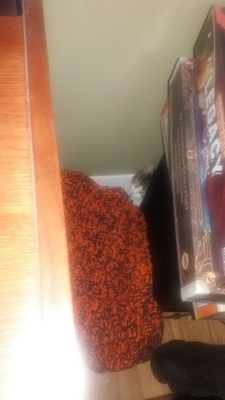 She started doing some hiding a little bit closer to the family, between the TV cabinet and Cute W’s colossal game collection. Maybe we were making progress? We were spending a lot of time analyzing the situation. For example, for almost a day, we started to notice that her kitty litter really stank. It was so weird, because we hardly ever smelled anything with Isis. What was that about? Whatever it was, it was a little check in my mental “con” list for this particular cat. And then I went to clean out the stankiness, and I realized the big issue was that she had caught and killed a mouse and left it next to the litter box. So, okay: erase that “con” and add a notch to the “pro” column. Except, even with the rodent removed, there still seemed to be a stink. Sigh. Maya would creep forward a tiny, tiny bit, or she’d let you pet her, and we’d think, “Hey! Maybe this is going to work out.” And then you’d speak a little too loudly and she’d scuttle away. And frankly, it got kind of annoying. I don’t know when the tide turned, exactly, but it turned, and it was against her. We needed to hold onto the cat, either way, for a bit more than a week, but at some point, we all just stopped trying very hard. She is a very nice cat, very sweet. But I think we were just too emotionally needy for this particular cat. She needed someone with plenty of patience and tons of quiet. We needed a cat who wanted to be around us and absorb all that love we’d had pent up for months. So, meanwhile, this was getting to be a sticky situation. If one of the girls had said, “I love her, I want to keep her,” I think we would have. She spent so much time hiding that she really wasn’t causing us any trouble. But she also wasn’t bringing us any joy. Or, she didn’t seem to be. But, almost daily, I was privately checking in with the girls, just in case. I think it was Day 6 by the time she managed to venture out onto the sofa. It was a momentous occasion. But even after she’d screwed up the courage to come out of hiding, it was always short-lived. If anyone walked in or out of the room or if the TV made a loud sound, she’d shoot back into a corner. It was exasperating. At some point we had a frank conversation about Maya and Isis around the dinner table. Their personalities were very different. I used to call Isis “The Mighty Huntress,” and she was just. . . a badass. She stalked around, big and bold, like she owned the place. She liked to explore, and she had no patience for stupid cat toys, because she was too busy terrorizing real, live prey. It just felt really tough to adjust to Maya’s “fraidy cat” personality. On the other hand, Maya seemed to like us well enough, and she licked our hands, something Isis never, ever did. That was one perk, but it just wasn’t enough to overcome the main personality issue. We reminisced about Isis, and sadly, Maya really suffered in comparison. Isis had these ridiculously big front paws with extra toes, and she had long, fluffy fur that made her look like a lion. Isis was a little wary around us at first, even if the girls didn’t remember it. But she always seemed tough, and we respected that. We are raising a household of badass girls, and she fit in well. We talked about how, when we first adopted Isis, Cute W specifically didn’t want a long-haired cat, and as I reminded him about that, Cute W sighed, “But her fur was so soft.” The fact that Maya’s short hair was not nearly so soft went unspoken, and instead we talked about how you might not realize what you want until you’ve got it. Cute W used to love brushing Isis’s long fur. At one point it felt a little ruthless, like when I mentioned Maya’s “stubby legs” and J laughed so hard that she spat her water across the table. But what I was trying to get to, and I think I did, eventually, is that you could have another cat who’s very unlike Isis–maybe a cat who likes to play with kitty toys and licks your fingers or doesn’t mind being carried around–in ways that are charming and unexpected. But this cat wasn’t our cat. The morning that Maya went back to our friend’s house, she was still mostly in hiding, still mostly suspicious of us, still alternating between offering herself up for some petting and looking at us as if she thought we might try to butcher her at any moment. It was sad. We knew she was going back to a place that she’d lived before, likely to be roommates with a cat she knew, and we hoped she’d be happier there. If the only alternative were a shelter, we might have stuck it out. But she had a safe place to go. We only want one cat, so keeping Maya would have prevented us from rescuing somebody else, and maybe we could find a cat who would actually like to hang around us. Which we will try to do, hopefully sometime soon, in an intentional way. We’re hoping that if we visit a shelter, we and our next cat will find each other. But not yet. We need some recovery time, because trying to win feline affection is emotionally exhausting. We just had a very good experience with Kitten Angels of Delmar (not just kittens). Their kitties are in foster homes and the foster momma was able to give us good insight into Buster’s personality and how that meant he would fit in to our family. She was right! 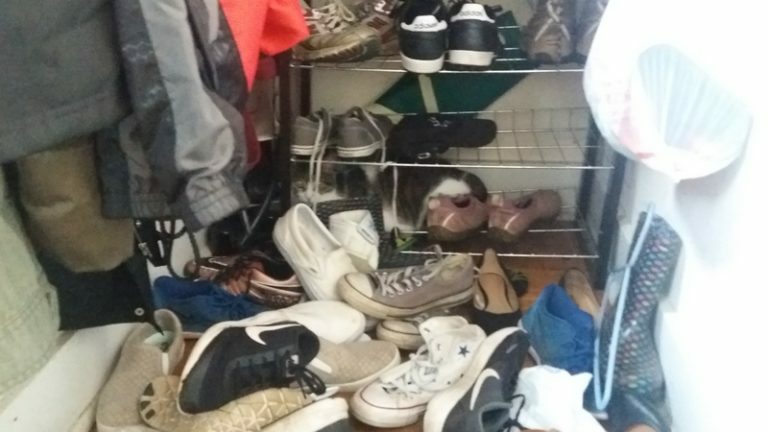 Good luck finding your next kitty. Thanks for the explanation of the Maya debacle. You sure tried hard. And you’re right. Maya is at my sister’s house with another cat she knows from her previous house, but poor Sarah has FOUR cats now! Sure would have enjoyed a walk with you today, such a beautiful day. It would have been so nice to catch up in person.